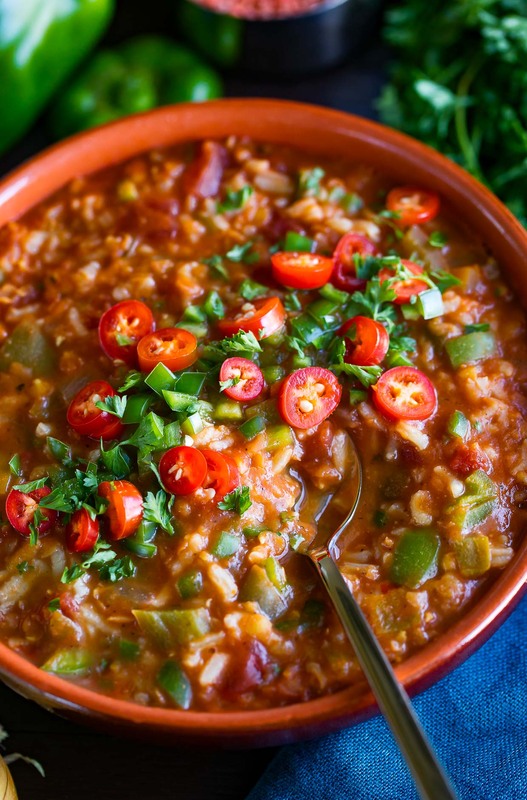 This tasty Vegetarian Stuffed Pepper Soup has both stove top and slow cooker instructions! Full of flavor and loaded with vegetables, this chunky veggie and rice soup is vegan + gluten-free. Ever since my garden went on full pepper-palooza status I’ve been making stuffed pepper soup on repeat. This vegetarian stuffed pepper soup is a twist on the classic, boasting a hearty helping of fiber and protein from creamy red lentils. 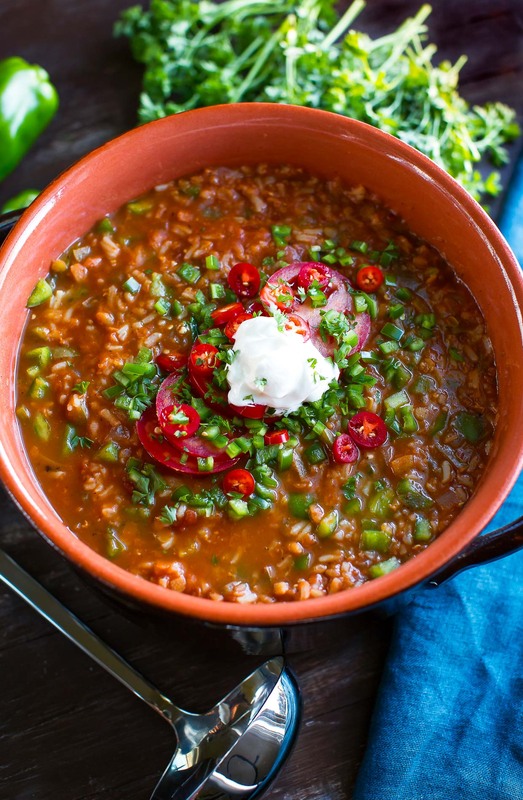 The red lentils cook crazy fast and almost pulverize themselves into the soup, making this stew-like stuffed pepper soup extra creamy and full of flavor. Love. It. So. As written the soup is vegan, dairy-free, gluten-free, freezer-friendly, and gloriously make-ahead too. what kind of peppers are in stuffed pepper soup? You’ll want to grab an assortment of bell peppers for this scrumptious soup/stew. Red, yellow, orange, and green bell peppers all work marvelously! My garden has an abundance of green peppers currently so I made my soup with mostly green but I like throwing a little red in there too when I have them! In addition to the bell peppers, I like to include onion, garlic, and a jalapeño for a kick of spice. 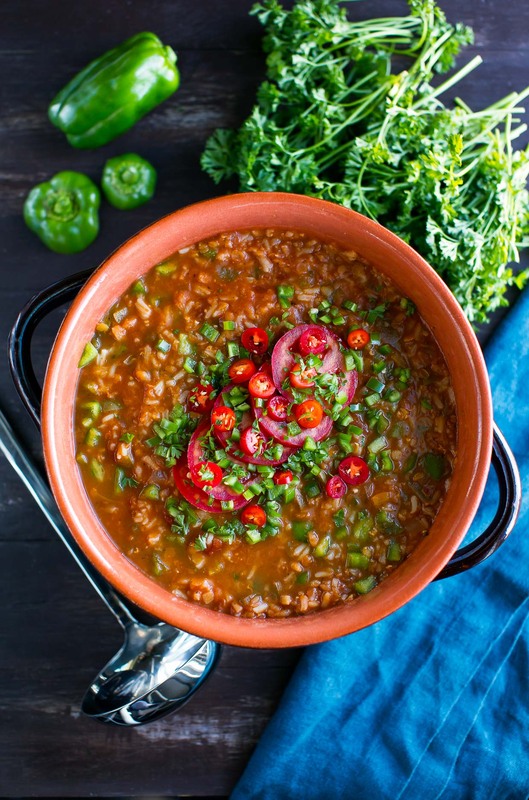 For a mild soup skip the jalapeño and for a fiery soup, feel free to add extra. Let your tastebuds be your guide. If you’re into having an assortment of textures in each spoonful, you can add extra chopped peppers to the soup before serving. It makes a beautiful garnish and adds a fun crunch! Crunchy corn chips (like fritos) are also pretty amazing on top. Fresh chopped tomato also makes a delicious topping! Crazy for cheese? Go for it! A must for me is a big dollop of sour cream on top.I love the contrast of the cool, tangy sour cream with the piping hot, slightly spicy soup. Skip if vegan or try it with vegan sour cream which is actually pretty darn amazing! 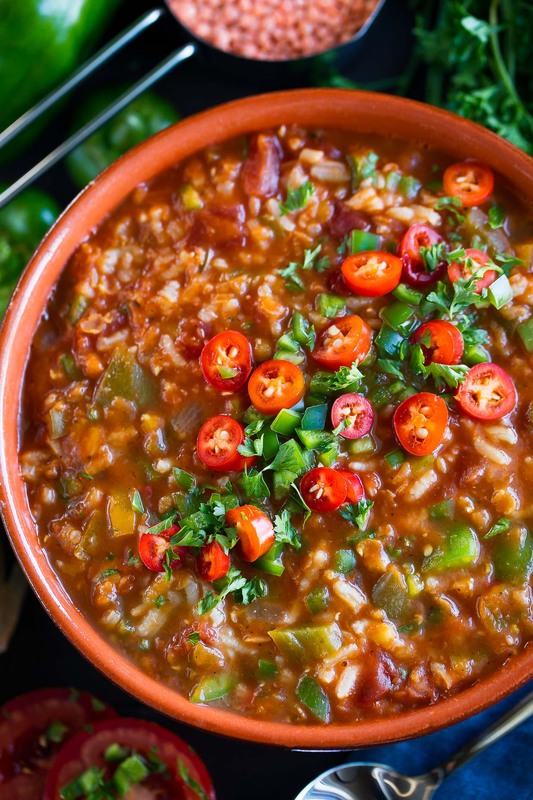 You can make this soup on the chunkier side like I do (it’s almost like a stove-top veggie + rice casserole or a big ole pot of stew) or thin it out with extra tomato sauce and broth. If you thin the soup just be sure to add extra salt, pepper, and spices to make up for the extra liquid. Easy peasy! The recipe yields approx. 10 cups (or 4-5 bowls) and the leftovers are fantastic and even more flavorful than the first day! It’s magical! You can also freeze bowls of soup for later, making this a healthy meal-prep and make-ahead dream come true! Recipe yields approx. 10 cups of soup or 4-5 bowls. Cook rice via package directions for your preferred method. I skipped my usual stove top rice method and made mine in my Instant Pot using the rice button. Either way works great! Next chop your veggies and peel and mince your garlic. In a dutch oven or large pot over medium-high heat, heat up 2 tsp of oil and brown your onion. Cook until tender, approx. 5 minutes, adding garlic towards the end. Next add everything but the rice to the pot and stir. Bring heat to boil, then cover and reduce to simmer. Allow soup to simmer for 20-35 minutes, or until lentils are tender and creamy. Add rice and stir to mix. Taste the soup, then adjust thickness to taste, adding a little more broth or tomato sauce to thin the soup if you prefer. Taste again and re-season to taste. Easy peasy! The recipe above is how we make it since we love the soup thick like a stew/casserole. Spoon into bowls and garnish with all your favorite toppings (sour cream is my favorite - vegan or regular!) see notes for some tasty ideas. Leftovers are fantastic and even more flavorful than the first day and this soup can also be frozen for later! Woot! Cook rice via package instructions using preferred method (stove top, instant pot, rice cooker) and set aside for swirling into the soup at the end. Add all the remaining ingredients into your slow cooker and set to high for 4-5 hours or low for 7-8 hours, until dried lentils are cooked through and veggies are tender. Swirl in the cooked rice, add all your favorite toppings, and dive in! * Keep a little extra broth or tomato sauce on hand to thin the soup if desired. 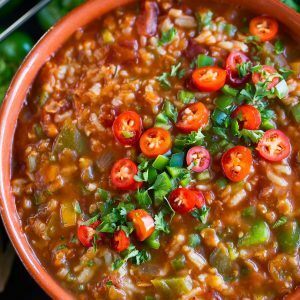 You can make this soup on the chunkier side as written (it's almost like a veggie + rice casserole or a big ole pot of stew - love it so!) or thin it out with extra tomato sauce and broth. If you thin the soup just be sure to taste as you go and add extra salt, pepper, and spices to make up for the extra liquid. Easy peasy! If you get a chance to try this tasty vegan + vegetarian stuffed pepper soup, let me know! Leave some love in the comment form below or tag your photos with @peasandcrayons on Instagram so I can happy dance over your creation! Have you tried adding extra liquid and cooking the rice with the rest. I was thinking of doing that in the crockpot. Hi Jenny! What happens when you cook the rice in the same pot (in this case the crock-pot) for the same duration of time is that it can end up super gluey and gelatinous and also make the soup itself change texture. Have you made rice-based soups in your slow cooker before and found a good way to get the texture right? In a pinch I’ve bought the steam-in-the-microwave packets of rice (they have shelf stable and frozen versions) and added that to the soup which would save you time and help maintain the soup’s texture and taste. This is amazing. It’s such an easy recipe, but I swear it tastes JUST like the stuffed peppers my mom used to make–except unlike those, it’s vegetarian, lean, high in fiber, and doesn’t call for ketchup as an ingredient. I made this, and it has instantly become a once a week staple in our house. Super easy and delicious. I made it in the crockpot the 1st time and on the stove top the last two times. Last night I made it for my daughter and her husband who are 100% vegan, and they loved it. Ahhh yay! Best news ever – thank you Dawn! Just made this soup, because I’m obsessed with stuffed pepper soup, and it is incredible! I’m so thrilled to have this recipe, perfect for my family as we work to increase our vegetarian dinner options. Thanks so much for a great recipe, I’ll be making it often! Making this tonight. Started at 4pm to eat at 5. It’s 6pm and still waiting for dry red lentils to cook. I thought it sounded too good to be true. Ohmygosh eeeeek! I’ve made this a few times now (legit obsessed) and a few friends and readers have had great success with it too. Can I help troubleshoot at all? Were the red lentils thicker or larger than normal? Any ingredient swaps? Was it at a bubbling simmer? What type of pot did you use here? Lid? This looks like a great option for cold winter lunches! Just wondering if you have made it in the Instant Pot yet? Hey Andrea, I totally want to! It’s just so easy stove-top that I keep making it on the stove over and over again. I’m forcing myself to do an IP test run soon though because I have a crisper full of peppers just waiting to be transformed into this soup! I think as written it’s going to be too much volume and thickness for the Instant Pot so I might need to change things up a bit with the liquid content and measurements so the soup isn’t too close to the max fill line. Do you think its ok to swap the rice for quinoa? Hi Annmarie! I’ve never tried soup with quinoa in it before so I’m not sure! You could try making it entirely grain-free and then add a little fluffy cooked quinoa to one bowl to test it out? This really did taste just like a stuffed bell pepper! I was feeding the kids so I skipped the spice in the soup and just served it as an optional garnish. So happy you enjoyed it Claire – thank you!! Thank you Dini! It’s a new favorite for sure!